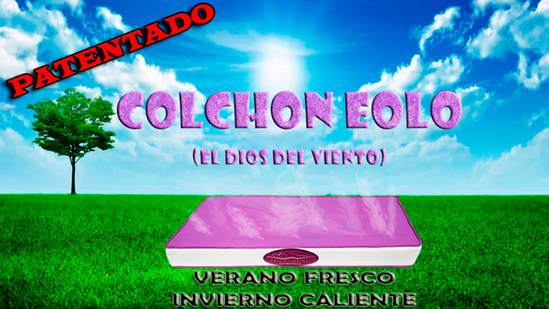 EL COLCHON EOLO ES EL UNICO COLCHON QUE GARANTIZA UNA HIGIENE PERMANENTE GRACIAS A QUE LLEVA INCORPORADOS UNOS ELECTROVENTILADORES QUE RENOVAN EL AIRE INTERIOR EN SEGUNDOS. DE ESTE MODO CONSEGUIMOS REGULAR LA TEMPERATURA TANTO EN VERANO COMO EN INVIERNO Y EVITAMOS QUE PUEDAN APARECER LOS TEMIDOS ACAROS. ES UN COLCHON RECOMENDADO PARA TODOS LOS PUBLICOS ,SOBRE TODO PARA PERSONAS QUE TIENEN PROBLEMAS ALERGICOS ,YA QUE ES UN DEPURADOR NATURAL DEL AIRE. ESTA COMPUESTO DE UN NUCLEO DE HR CON VISCOELASTICA PERFORADA PARA PERMITIR EL PASO DEL AIRE POR LA TOTALIDAD DEL COLCHON SIN RUIDOS APENAS. ES UN PRODUCTO EXCLUSIVO Y PATENTADO QUE SOLO LO PODRAN ENCONTRAR A TRAVES NUESTRO O DE TIENDAS ESPECIALIZADAS EN DESCANSO QUE TRABAJAN CON NOSOTROS.